Mapping the Germans: Statistical Science, Cartography, & the Visualization of the German Nation, 1848 – 1914. Simon Dixon, Mark Mazower, and James Retallack ed. When I accepted the task of reviewing this book I took it on with a little trepidation as my specialization is the history of cartography and not statistics. I was however pleased to see that, with only 161 pages of text, the book was not a monumental tome that regurgitated masses of statistical evidence and graphs covering the over 66 years of the study, but rather a slim volume – one that presented the reader with a well laid out analytical arrangement of the topic. This is not to say that the author did no primary research, completely the opposite, with over 250 primary publications and numerous archival documents, the depth of research is a welcome change. What is important is that the book has not been written only for the subject specialist (Fachidioten), but for a more general academic public. The author presents a clear image of how census offices and statisticians used maps to present graphically their ethnographic information using maps. 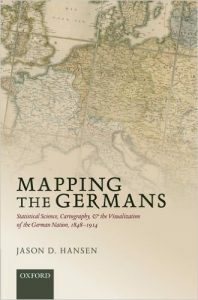 He lays out how the divergent ideas of what made a German a German were argued and how it played out in the map images presented. The argument of how to define ethnicity is also shown to be a Europe-wide and not just a German problem. He continues to build on this to show how these maps came to be seen as authoritative regardless of the legitimacy of their sources. The danger of how these maps and their ethnographic information were subsequently subverted to support the nationalistic rhetoric of the early 20th century is well presented. The author ends with a view of the pitfalls of the use of ethnographic maps during that post war reordering of the borders within Europe. There are only two criticisms that I have, firstly is that the author or editors saw fit to reduce the size and number of illustrations from those present in the original dissertation that is the foundation for this book. This has resulted in that most of the maps present are too small to be read. Also the enlarged details of the maps have been converted to gray-scale images that make them, like the full map images, unreadable. This is a little perplexing as it is contrary to the change in title form his dissertation ‘Where Lies Germany: Science and the Visualization of the German Nation, 1848-1914’, in that ‘Mapping’ is placed at the beginning of the title and ‘Cartography’ inserted into the subtitle, both clearly indicating that the book is about the maps. The second and perhaps pingelig criticism is that the author has reversed the cartographic usage of small v large scale in his text. Further his description of the lithographic printing process is somewhat basic and misleading in regards to image quality, the innovation of color printing and its impact on the power of resulting maps. These aspects detracted from my enjoyment of the book from a visual and history of cartography aspect, but not from the overall message that the author’s thesis wished to present. I would recommend this book for scholars teaching 20th century European and German history.